I have been a huge fan of The Critical Thinking Co. since I first started homeschooling. We own so many of their products, and I am always thrilled to have the chance to own more. One of the greatest things about their materials is the wide age range for many of the books. 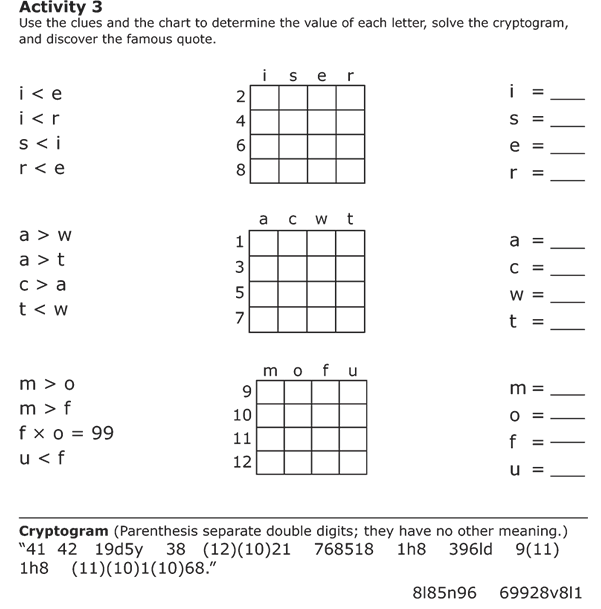 Like, for example, Crypto Mind Benders, which The Critical Thinking Co. recommends for grades 3-12. I decided to test that a bit, and I used this book with all four of my boys. They are in grades 9, 7, 5 and 2. Okay, so Richard is just below the recommended grade range, technically. But he is doing math at a 3rd grade level, so I figured we ought to try it. We have used the regular Mind Benders off and on for years. You know, the logic puzzles where four neighbors with names starting with the letters A, B, C and D live in four different colored houses and have four different types of play equipment in their yards. You have some clues to help you figure out that Mr. A lives in the blue house that is the 2nd one on the street, and he has a sandbox out back. Crypto Mind Benders is a bit of a twist on that. The clues are mathematical expressions, and to solve the "secret code" the student needs to use algebraic thinking . Because many (most?) of the Critical Thinking products have generous copyright provisions, allowing me to duplicate it for all the students in my home, I was able to make copies for all four boys. We passed them out and started to work through the sample together. 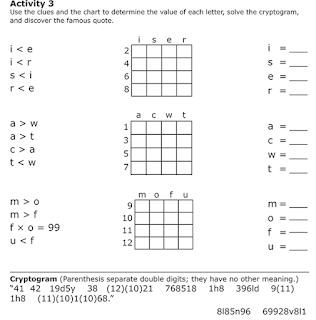 The basic idea is that you have some mathematical statements using letters, and you need to deduce which number represents what letter. That's part of the algebraic thinking. When you determine which is what, you can decode the text and solve the "Famous Quotation." Activity three is available to view on their website when you click to "look inside." This gives you a pretty good idea as to how the book is set up. My older three all immediately told me that this meant that s > t > a > d, and since the numbers we were working with were 1, 2, 3 and 4, that meant s = 4, t = 3, a = 2 and d = 1. I laughed, but I said... "You are right, however at least for the sample, we are going step by step and using the chart, just so you know how they work." We started with a > d, and the 9th grader said, well, that would mean that a cannot be 1, and d cannot be 4. So the big three filled out the little chart with minus signs, indicating that a wasn't 1 and d wasn't 4. Richard (the 2nd grader) was totally confused at this point, so we let him go play with his sister (she's in Kindergarten) and we continued without him. Thomas (5th grade) volunteered that a < t means that a can't be 4, and t can't be 1. And that also proved that d couldn't be 3, because it has to be less than a. The 7th grader took the 3rd statement -- s > t, and said that s couldn't be 1, t couldn't be 4, and s couldn't be 2. And that meant that d had to be 1 (because nothing else can be) and s had to be 4 (because nothing else can be). Connor had clearly already filled out the form and was just listening... so Thomas said that since a was less than t, a had to be 2 and t had to be 3.
for numbers 5-8. The other letter is i. Just in case you are trying to play along. After completing the sample together, all three of the older ones were now comfortable with doing these puzzles on their own, knowing they can come and talk to me if they need a nudge about how to attack a particular set of truths. Richard, was another story. He and I had to sit down one-on-one and go over the sample step by step. He needed some suggestions in order to figure out how to make this work. But after getting through the sample, he was at least able to get a start on the first "real" puzzles. That gets us back to what I said near the beginning of this: One of the greatest things about their materials is the wide age range for many of the books. My older children can work through this independently. At the lowest end of the targeted range, Richard is able to work through it if I am sitting with him, throwing out a few well-timed "Does that statement tell you anything else?" or "What else do you know about 5?" comments. My kids all think these puzzles are fun, though Richard is still a bit intimidated. I only allow them to do one at a time -- Connor would prefer to sit down and work the entire book in a single sitting. 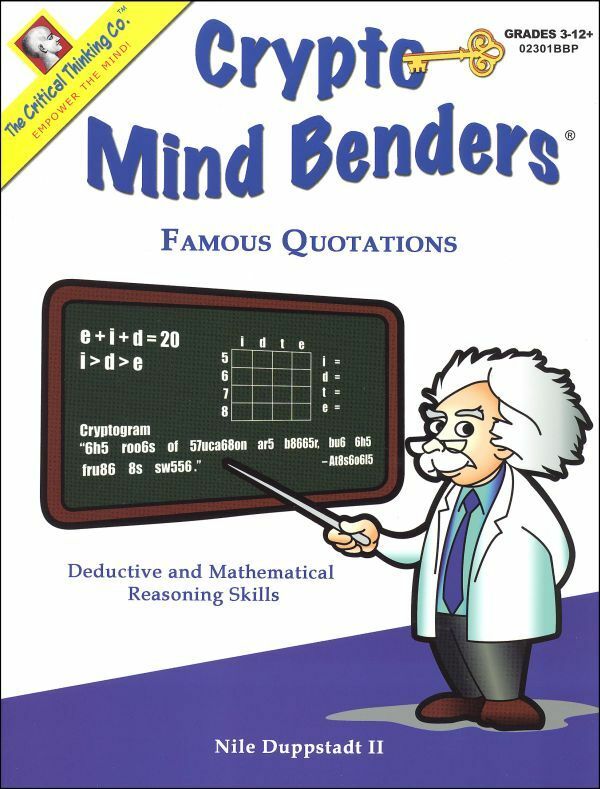 Crypto Mind Benders: Famous Quotations is available for $10.99 for either a book or an ebook. I think that is a bargain.